Regional bank, CIBC First Caribbean has provided over USD$1.8 billion in funding for infrastructure projects over the past three years. 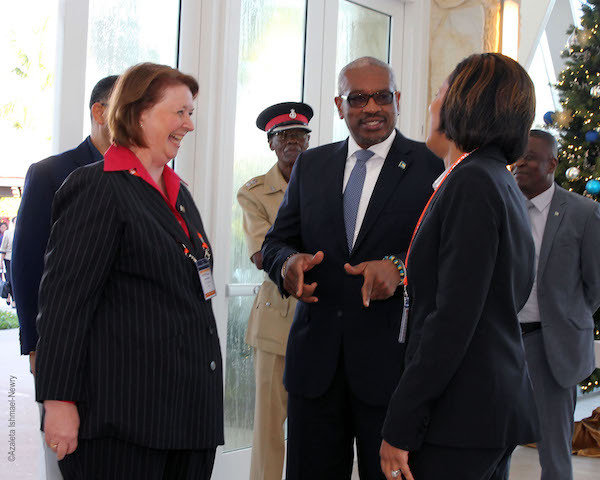 Of that amount USD$500 million have gone to support energy utility companies in the Bahamas, Aruba, Curacao and Jamaica said the bank’s Chief Executive Officer Colette Delaney as she delivered remarks at the opening of CARIF 2018 – 3rd Caribbean Infrastructure Forum at the Baha Mar Resort, Nassau. The decision to co-sponsor the conference along with KPMG underlines CIBC FirstCaribbean’s ongoing commitment to the region. Ms. Delaney said the two-day Agenda zeroed in on some of the pivotal challenges and opportunities confronting the region in terms of infrastructure planning and development. “These include climate change with its consequent rise in sea level and all that this portends for a region whose key earner is white sandy beaches; stronger storms in areas where building codes are weak or non-existent; rising landfills and shrinking land space as islands struggle to cope with solid waste disposal. These are some of the real challenges facing this region, which the right partnerships can turn into opportunities. “Last year’s devastating hurricanes taught us some critically important lessons – chief among them was the very vulnerable nature of key infrastructure in the Caribbean. We all saw how storms can paralyse entire island-nations many of which have one or two major highways, a single air and seaport, a single power plant and key government and private sector buildings clustered in one location. She added that even though this region is blessed with an almost infinite supply of sun, wind, water and thermal energy, with some exceptions, they remain largely untapped resources throughout the region. Creative private public partnerships for the development and diversification of the energy sector, is need to bring about a more balanced use of green energy along with that derived from traditional fossil fuels. Bahamas Prime Minister Dr. 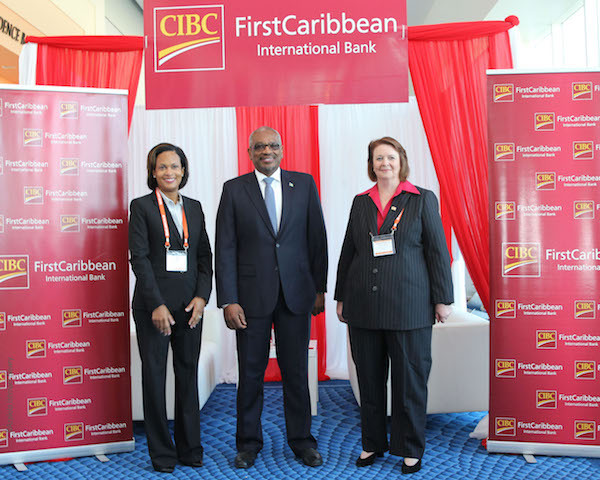 The Most Honourable Hubert A. Minnis shares a light moment with Chief Executive Officer of CIBC FirstCaribbean Colette Delaney (left) and the bank’s Managing Director, Bahamas and TCI, Marie Rodland-Allen. Prime Minister of the Bahamas Dr. The Most Honourable Hubert A. Minnis at the start of the CARIF 2018 conference with CIBC FirstCaribbean’s Managing Director, Bahamas and TCI, Marie Rodland-Allen (left) and CEO Colette Delaney. CIBC FirstCaribbean is a relationship bank offering a full range of market leading financial services through our Corporate and Investment Banking, Retail and Business Banking and Wealth Management segments. We are located in seventeen (17) countries around the Caribbean, providing the banking services that fit our customers’ lives through approximately 3,000 employees in 68 branches and offices. We are one of the largest regionally listed financial services institutions in the English and Dutch speaking Caribbean, with over US$12 billion in assets and market capitalization of US $2 billion. We also have an office in Hong Kong. The face of banking is changing throughout the world and CIBC FirstCaribbean intends to lead these changes with the expertise, integrity and knowledge gained from banking in the Caribbean since 1836. CIBC FirstCaribbean is a member of the CIBC Group. CIBC is a leading Canadian-based global financial institution with 11 million personal banking and business clients. Through our three major business units - Retail and Business Banking, Wealth Management and Capital Markets - CIBC offers a full range of products and services through its comprehensive electronic banking network, branches and offices across Canada with offices in the United States and around the world.